High school sweethearts that needed more space, Joey and Brittney Jones both come from military families. They met early in life because their parents served together in the National Guard, and married shortly after graduating high school. Now they, and their many pets, are enjoying a brand new ENERGY STAR® home. Joey and Brittney Jones both grew up in Campbellsville, Kentucky, and have lived in the area their entire lives. They began dating while attending Taylor County High School. The high school sweethearts married shortly after graduating and set homeownership as a goal for their new family. Brittney is a housekeeper with a local hospital, while Joey works at the Boone National Guard Center in Frankfort, Kentucky, repairing and inspecting military equipment. Following in the family tradition, Joey has been a Sergeant in the National Guard since 2008, and has worked at the National Guard Center since 2012. As they began working during and after high school, they rented all over Campbellsville. Unsurprisingly, renting was unaffordable in the long term if they wanted to own their own home. The fact that they were losing money renting was not lost on Joey and Brittney, but purchasing a home is expensive no matter which way you approach it. In order to achieve their goal of homeownership, they made some sacrifices. For a year and a half they lived with Brittney’s parents in order to save money to purchase a home. While exploring their options for homeownership they found a number of options, both site-built and manufactured. One place they kept coming back to was Goff Homes, also in Campbellsville. After speaking with owner Eddie Goff, they realized that with their budget a manufactured home would not only be more affordable, but that they would also get more for their money. Upon finally deciding to buy, they were introduced to Darrell Overstreet with Key Mortgage, a SmartMH partner in Columbia, Kentucky, who informed them about the ENERGY STAR upgrade program. 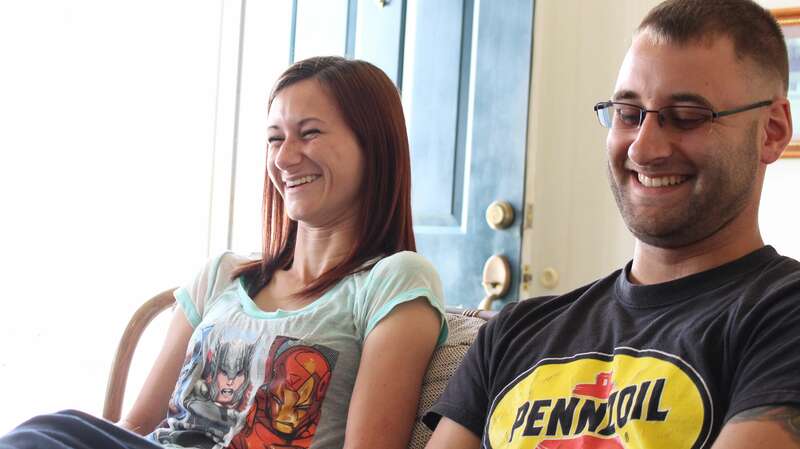 It seemed simple to Joey and Brittney—get a better home and save money at the same time! With expected utility savings of $66 a month, this home is going to save them money throughout the entire lifetime of the loan. Because they participated in the upgrade program, they were able to secure a SmartMH loan through the Veteran’s Administration and Kentucky Housing Corporation. With a 30-year fixed-rate of 4 percent and 100 percent financing with closing costs included, they know they received a good loan. The details of their loan package required a little extra work, but after hearing what would be included Joey and Brittney were happy to accept the upgrades, like a block foundation and front porch. In order to make the financing work and ensure a good home, the loan required an FHA Title II Permanent Foundation and inspection. Their spacious new home was built by Fleetwood Homes to have a warm, welcoming feeling. They achieved this with an open floor plan, including a large living room and kitchen area. With 1,800 square feet of living space, Joey and Brittney (along with their four cats and two dogs) will have plenty of room to grow. Though they had been feeling cramped living with Brittney’s family, they didn’t choose to go far. The location they selected for their home was just down the road, on land that had been in Brittney’s family for 15 years. This ensured that they would stay close to the things that matter most to them: family, friends and nature. Working with SmartMH partners, Joey and Brittney Jones were able to purchase a home that will provide for them now and in the future.